The Livestrong article states: “More and more people are choosing to use alternative medicines to treat minor illnesses rather than taking a prescription. Putting essential oils in or near the eyes isn’t something that is widely known about, but there are several that can aid in the treatment of eye problems. Before using essential oils for your eyes, always contact your doctor. Not only is there no evidence that any essential oil can help with vision problems, age-related or otherwise, but placing any essential oil “in the eye” is extremely dangerous advice. Almost any undiluted essential oil coming into contact with the ocular membranes will be corrosive, possibly causing scarring of the cornea, and certainly causing significant pain. A 2009 report from an ophthalmologist in Bristol UK, describes partial loss of corneal tissue (i.e. erosion) when a 73-year-old man dripped Olbas Oil into his left eye (he had no right eye) because he thought he was using eye drops (Figure 2). He was “considerably incapacitated.” but recovered after a week of treatment with “topical antibiotics and lubricants.” On checking, the author found that just his hospital, in the previous 18 months, had seen 12 patients who had mistakenly dripped Olbas Oil into one eye. He describes the result as a chemical burn, though he found that Olbas Oil in tears was pH neutral (most chemical burns are caused by sub-stances that are strongly acid or alkaline). All “Olbas Oil patients” recovered fully within one week following intensive treatment (Adams et al, 2009). Olbas Oil may cause problems even when not applied directly to the eyes. The mother of a fourmonth-old boy placed several drops of Olbas Oil in his right nostril in an attempt to help his respiratory infection, not realizing that the product warns against use in infants. The child immediately showed signs of respiratory distress and was taken to the emergency room. Two hours after admission his eyes became inflamed and examination revealed bilateral superficial corneal scarring. He also had conjunctivitis and could not open his eyes. They were flushed with saline over four days and he recovered with no residual scarring (Wyllie and Alexander, 1994). More than 65,000 work-related eye injuries and illnesses are reported annually in the USA, a “signi-ficant percentage” of these being ocular chemical burns. They require rapid treatment, and severe burns have a poor prognosis. The standard treatment is copious irrigation with saline solution for 1-2 hours. 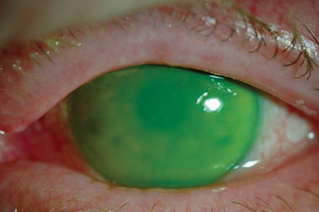 Contact lenses should not be removed initially (Peate, 2007). With essential oils, fatty oil has been suggested as an appropriate first aid treatment though the advantage of saline is that the eyes can be continually flushed and this is less easy with fatty oil. What about diluted essential oils? Put oils in a glass dropper bottle with a lid on it. “V-6” is a proprietary blend of vegetable oils. The above implies that using these oils on a daily basis is likely to have a healing effect in cases of cataract, macular degeneration, or failing eyesight. Although the article continues to describe various effects of the essential oils, none of them have any relationship with any of these conditions. So the question arises – how to weigh potential benefits against potential risks? The word “experiment” in the above seems appropriate. Eyesight problems are difficult to treat and, once damage has occurred, recovery is not always simple. A 3% dilution may not be sufficient to cause corneal erosion, but on the other hand there is no evidence of any benefit. One concern is that the wrong dilution may be used, and the risk of this is substantial. For example, it would be easy to confuse “tbsp” with tsp,” resulting in a dilution of about 10% instead of 3%. In a Chinese study, an ointment containing 5% Tea tree oil was used by patients whose eyelash follicles were infested with “eyelash mites” (Demodex folliculorum). The ointment was applied to the lid margins with eyes closed, daily for 4 weeks after washing the face, and resulted in considerably less itching and fewer mites. Two of the 24 patients experienced slight irritation from the ointment. The 5% concentration was arrived at after preliminary testing using various dilutions on rabbit eyes (Gao et al, 2012). –Undiluted essential oils should not be applied to the eyes. –It is rash to suggest that essential oils are commonly used to treat eye problems. –Eye injuries and diseases are medical conditions, and any product claiming to treat them is a medicine, subject to drug legislation. –There is currently no evidence that applying dilutions of essential oil into the eyes will be beneficial in any condition. –Diluted (5%) Tea tree (Melaleuca alternifolia) essential oil may help eradicate eyelash mites, but it should not be placed into the eyes. Adams M K, Sparrow J M, Jim S et al. (2009). Inadvertent administration of Olbas oil into the eye: a surprisingly frequent presentation. Eye (London). 23, p244. Gao Y Y, Xu D L, Huang I J et al. (2012). Treatment of ocular itching associated with ocular demodicosis by 5% tea tree oil ointment. Cornea. 31, p14-17. Peate W F. (2007). Work-related eye injuries and illnesses. American Family Physician. 75, p1017-1022. Wyllie J P, Alexander F W. (1994). Nasal instillation of ‘Olbas Oil’ in an infant. Archives of Disease in Childhood. 70, p357-358. Image: Courtesy of Naure Publishing Group and used with permission.